to solve your most complicated machining jobs. The major components are made from high quality Meehanite cast iron, which are annealed and stress-relieved before machining. The spindle with entire headstock assembly is counter-balanced by pneumatic system to minimize the column and headstock vibration during acceleration / deceleration . The 5-axis synchronized machining allows complicated work pieces to be finished in just one setup, and it increases machining efficiency and accuracy, also reduces machine idle time. Pinnacle AX 320 / AX 450 are your best choice for producing aerospace components, medical equipment and any parts with multiple curved faces. 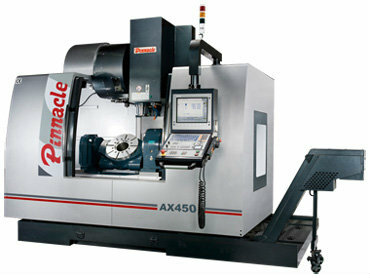 AX320/ AX450 are proven to be super machines for high efficiency and accuracy. Each Pinnacle machine is subject to dynamic and static accuracy tests. Pinnacle machine accuracy meets ISO 10791 VDI 3441, ISO 230, JIS B6388 and ASMEB5 standards. 3 linear axes X/Y/Z plus rotary and titling axes A/C offers almost infinite solutions to your 5-axis or multiple faces machining jobs. The two-in-one rotary/titling table features easy maintenance and low service cost. AX320 A-axis swivels 150°and AX450 swivels 220° to optimize machining space and allows complex workpiece to be finished in just one setup and reducing cycle time. Robust Structure ensures long term accuracy, year after year. The machine's actual cutting quality and accuracy relies on the temperature control techniques. No machine can be called precision machinery without mastering this critical know-how. Pinnacle 5-axes machines employ chiller to keep the headstock in a constant and stable temperature level, and depended on customer's work shop condition, coolant through ball screws are available to minimize the temperature variation. Oil cooling through ball screws on X, Y, Z axis minimizes thermal deformation and backlash, while ensuring smooth motion during rapid traverse. The Z-axis is pneumatic counter-balanced via high response pneumatic cylinders. Plus an air reservoir tank to boost the balancing performance, ensuring fast and stable Z-axis movement, giving high surface finish. X/Y/Z axes adopt roller guideways for optimum rigidity and speed 6 rolling shoes on X/Z axes minimize damping effect. Drive motors direct coupled with pretensioned and oversized ballscrews to ensure cutting quality. Each Pinnacle machine is subject to dynamic and static accuracy tests. Pinnacle Machine accuracy meets ISO 10791 VDI 3441, ISO 230, JIS B6388 and ASMEB5 standards. Quality is not a job, it is our attitude. Quality comes not from inspection but from every Pinnacle staff's mentality. The state-of-the-art inspection equipments only help us to prove our attitude and accuracy results. The PLANE feature makes it easy to define a tilted working plane. With Cycle 19 with swivel heads or tilting tables. You program the operation as usual in the working plane, for example in X/Y. The machine runs the program in a plane that has been tilted by one or more rotary axes with respect to the main plane. Chip flushing system is equipped to remove cutting chips inside of enclosure, which prevents chip accumulation and any possible damage to the linear guideways and ball screws. DCM enables you to check for collision in the test run mode before actually machining a part. To avoiding machine dow times. Simulation for a safety process. 20 Bar high pressure pump and sub tank assure CTS system offers the highest efficiency of chip disposal.. Hinge type or scraper type chip conveyor in front side of machine (able head to left or right) removes chips from machine. Kinematics Opt. is an important component to help you meet these high requirements: With a HEIDENHAIN touch probe inserted, a 3-D touch probe cycle measures your machine's rotary axes fully automatically. The results of measurement are the same, regardless of whether the axis is a rotary table, a tilting table or a swivel head.